Note this article and products shown are for information purposes only. It is not intended to be medical advice or treatment. Please consult a specialist for treatment. Using the right shoe insole can give you better arch support improved alignment and can reduce stress on your legs, feet, hips and back so you can function in comfort. To find insoles that will work best for you it is important to consider what type of shoes you will use them for and what type of activity you will be doing in those shoes. Why you may need insoles? Your foot has two pads that are made of fat. A heel pad and a forefoot pad that is at the base of each toe. The heel and forefoot pads need to sit in the right pocket in the shoe to really cushion and support your foot. Insoles are important because they help to support the foot as it goes through the gait cycle. The key with insoles is to make sure that your foot is as stable as possible so that that that instability is minimized. Shin splints, heel pain, calf problems, calluses, blisters, and pain in your lower body can result in not having the right insoles. Do I need additional inserts if my shoe already has one? Most shoes come with a soft cushion insert. It is usually polyurethane foam with a cloth layer on top. You can roll them up in your hand. They are basically just there to cushion your foot with no support? To find which insole works best for you it's important to know what type of arch you have. Most feet can be categorized into three arch types. They are normal, flat, high. If you have a normal arch foot then try cushioning insoles that provide light support. If you have a high arch foot then you will likely need shock absorbing insoles to help reduce impact from walking and running or plantar fasciitis. Arch supportive insoles offer support to the arch and help stabilize the heel by putting the pressure across the whole base of your foot. What is a flat arch? Most people have a small gap under the arch of their foot, most noticeable when they are standing up. The arch, the inner part of the foot is raised off the ground and curved. People with flat or fallen arches have a low or no arch at all, so their feet are flat on the ground. Custom insoles that are well fitted and supportive can help with flat feet. Your foot is designed to absorb shock. Some amount of ankle and foot movement is normal. More than 15% rotation of the foot and angle is considered excessive. What are the different forms of pronation? Pronation is the inward roll of the foot. The ankle moves inwards. 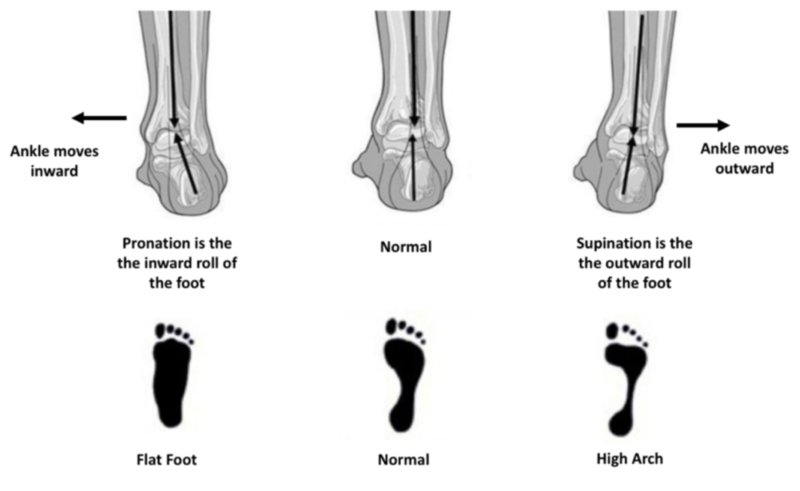 Supination is the outward roll of the foot. The ankle moves outwards. How can you tell if you pronate or supinate? The imprint of your arch and the wear and tear of your shoes can give you some clues. The wet foot test - place your wet feet on a bath mat or wet paper towels and look at the footprint. A very high arch shown by a narrow portion of the foot in the footprint means you supinate. If you have flat feet as shown by no arch, then you pronate. Pronation is not limited to just people with flat feet. Your arches may appear normal in a seated position the problem occurs you have a load on your feet.. Secondly, look at the bottom of your jogging shoes for wear patterns. If you pronate you will see more wear along the inside of the soles. If you supinate there will be more wear on the outside of the shoe. What is the right size of insoles to buy? Most insoles are designed and sized by shoe size and some can be trimmed for a customized fit. You may want to try full-length insoles that cushion your entire foot especially if you're doing a lot of walking or standing and need extra cushioning or better shock absorption. 3/4 length insoles give your toes more room and can be worn with open toe shoes or high heels. Do I need a custom or orthotic insoles? Orthotic insoles are arch specific but can also include metatarsal support and heel control. These insoles are both rigid and semi rigid and not only provide support but proper foot alignment and motion control. Since being more rigid and stiff it is natural for them to feel uncomfortable or even strange at first, but after a short break-in period you wouldn't want to go a day without them. In selecting an orthotic arch support it's important to know your arch type. Custom orthotic in soles are typically recommended for those that have biomechanical conditions such as over pronation fallen arches or large bunions. Orthotic insoles are less expensive than custom orthotics some can be heat molded to your foot shape giving you more cushioning and pain relief. The plantar fascia is a long thin ligament that is beneath the skin at the bottom of your foot. It is there to absorb the daily strain we put on our feet. Too much pressure or poor support can damage or tear theses tissues resulting in Plantar faciitis. A condition known as pain and stiffness from the inflammation of the plantar fascia. Those with flat feet fallen arches or foot conditions like plantar fasciitis can benefit from a good supportive insole cushioning or shock absorbing insoles that have deep heel cups, thick padded foam or gel materials built in these insoles give you shock absorption and tension relief. If you have pain in the ball of your foot or if your feet feel tired from standing too long or walking on hard surfaces, the motion control insoles combine the padding of cushioned insoles with the balancing features of arch supportive insoles. They're a good choice for runners or walkers that want the best of both worlds for comfort and stability. If your foot tends to supinate or rolls outward try cushioning and shock absorbing insoles or you may want to try arch supportive insoles with a firm arch support and deep heel cups.